Don’t ever say that here at Mr-Tshirt, we don’t let you know where you can get free T-Shirts From! 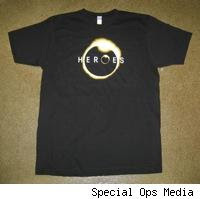 TV Squad’s Heroes Free T-Shirt Giveaway some rules! - You can only enter once. - The winning entries will be chosen completely at random. And there is a bunch of other legal stuff but you can read that on their blog – so what are you waiting for! And the best news is you can buy this T-Shirt for just over $20 from the Mr-Tshirt Shop here!